Brezhnev, Leonid Ilich [Брежнєв, Леонід; Russian: Брежнев, Леонид], b 19 December 1906 in Kamianske in Katerynoslav gubernia, d 10 November 1982 in Moscow. Soviet political leader, first secretary of the Central Committee (CC) of the Communist Party of the Soviet Union from 14 October 1964 (general secretary from 8 April 1966), and chairman of the Presidium of the USSR Supreme Soviet from 16 June 1977. Brezhnev’s grandfather, Yakov, and father, Ilia, were immigrant workers from Kursk gubernia. From 1923 to 1927 Brezhnev attended the Kursk Tekhnikum for Land Utilization and Reclamation and, in 1930–1, the Agricultural Institute in Moscow. In 1931 Brezhnev joined the CPSU and returned to Ukraine from the Urals to work at the Kamianske steel mill and to finish his degree in engineering at the local metallurgical institute (1931–5). Brezhnev's political career began in Ukraine. He held various posts in the Party oblast committee (obkom) in Dnipropetrovsk (1938–40), including that of secretary for propaganda during the Great Purge. During the Second World War Brezhnev rose to the rank of major-general, with such duties as chief of the Political Administration of the Fourth Ukrainian Front (1945) and of the Carpathian Military District (1945–6), where he participated in the Soviet campaign against the Ukrainian Insurgent Army. 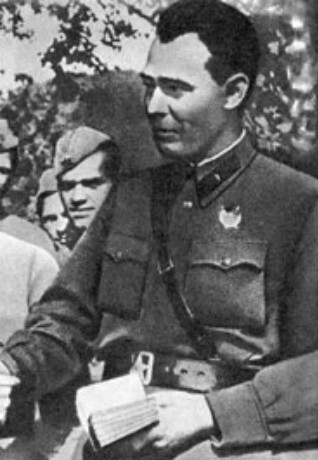 After the war Brezhnev was oblast first secretary in Zaporizhia (1946–7) and Dnipropetrovsk (1947–50), first secretary of the Communist Party of Moldavia (1950–2), and secretary of the CC CPSU and candidate member of the CPSU Presidium (1952–3). As Nikita Khrushchev’s successful representative for the virgin-lands program, he was second secretary (1954–5) and then first secretary (1955–6) of the Communist Party of Kazakhstan. He became a full member of the CPSU Presidium in 1957, head of the Presidium of the Supreme Soviet (1960–4), and finally first secretary of the CC CPSU after the overthrow of Khrushchev in 1964. Brezhnev changed Khrushchev’s regional pattern of Soviet economic administration (see Regional economic councils) back to the rigidly centralist, functional, ministerial pattern. Opposition from Ukrainian economists and government officials was disregarded, and generally, as supreme ruler of the USSR, Brezhnev systematically asserted his power and centralist policies in Ukraine. 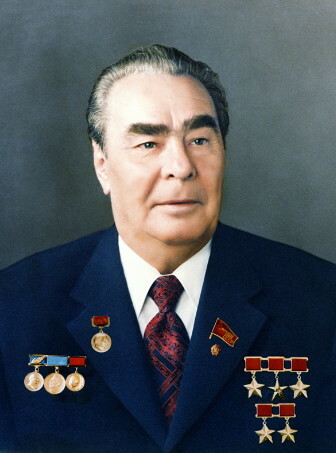 Brezhnev defeated the Kharkiv-Kyiv (Pidhirny-Shelest) faction in the Soviet leadership. Mykola Pidhirny (Nikolai Podgorny) was removed from the CC CPSU Secretariat (December 1965) and ousted from the Politburo (May 1977). Petro Shelest lost his position as first secretary of the Communist Party of Ukraine in May 1972 and his seat on the CPSU Politburo in April 1973. He was replaced as first secretary of the CPU by Brezhnev’s protégé, Volodymyr Shcherbytsky, a prominent member of the Dnipropetrovsk faction. Whereas Pidhirny’s and Shelest’s factions were more assertive of Ukrainian political, economic, and cultural autonomy, Shcherbytsky’s group has been more subservient to Moscow. Although continuing the assimilationist pressures of Khrushchev’s last years, Brezhnev’s legacy in Soviet nationality policy appears to be threefold. On the theoretical level, at the 24th CPSU Congress (1977) Brezhnev altered Khrushchev’s ‘merging of nations’ to ‘the unshakable union’ and endorsed the concept of the ‘Soviet people,’ as ‘a new historical community’ that has emerged during the ‘building of socialism in the USSR.’ On the practical level, despite some pressure to abolish the pseudosovereign Soviet republics, Brezhnev accepted their continued existence in the new 1977 Soviet constitution. Thirdly, on the policy level, in May 1979 the Tashkent Conference on ‘The Russian Language—The Language of Friendship and Co-operation of the Peoples of the USSR’ passed a secret draft calling for the mandatory teaching of Russian in every non-Russian kindergarten and nursery. It appears that, despite Brezhnev’s close personal connections with Ukraine, his attitude towards Ukraine was that of a Russian centralist attempting a gradual conversion of Ukraine back into the Little Russia or New Russia of the 19th century.